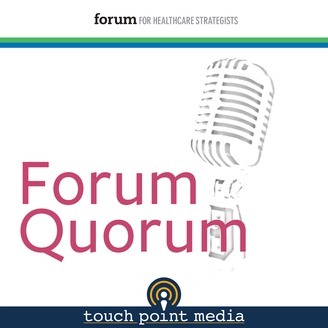 This is the Forum Quorum – an audio series presented to you exclusively by the Forum for Healthcare Strategists. Whether you work within a hospital or are exhibiting on behalf of your company, the advice and expertise we will share will inspire and inform. 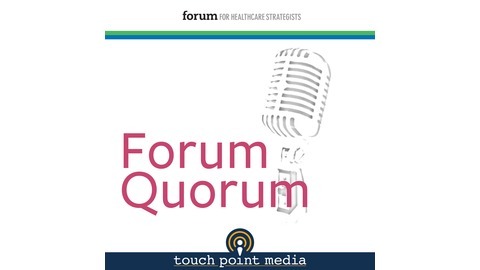 This is the Forum Quorum - an audio series presented to you exclusively by the Forum for Healthcare Strategists. In the next hour, our panel of healthcare industry leaders will discuss how you can optimize your next conference attendance. Whether you work within a hospital or are exhibiting on behalf of your company, the advice and expertise we will share will inspire and inform. In this inaugural episode, a panel of experts discusses how hospitals and healthcare vendors could make the most out of their conference attendance. From ensuring your conference exhibits are impactful, to connecting with peers and partners, to even developing a speaking strategy, this moderated discussion is a must-listen for anyone planning to attend the Healthcare Marketing & Physician Strategies Summit. Our panelists include: Preston Gee, Vice President, Strategic Marketing at CHRISTUS Health Lisa McCluskey, Vice President, Marketing Communications at CHI Memorial Health Care System Rob Rosenberg, President of Springboard Brand & Creative Strategy Reba Thompson, Director of Client Partnerships for WriterGirl & Associates Chris Boyer, Director of Marketing Strategy & Analytics, Fairview Health Services Reed Smith, Founder, Social Health Institute This podcast is brought to you exclusively by the Forum for Healthcare Strategists, a network of communication and professional development, with the ultimate purpose of inspiring new, creative, and more effective healthcare for individuals, organizations, and communities. To learn more about the Forum and register for the upcoming Healthcare Marketing & Physician Strategies Summit, visit them online at www.healthcarestrategy.com.